Several weeks ago the OB Rag published an article I wrote about burners (people who spin fire at Burning Man), and hoopers (people who dance with flaming hula-hoops). A group of hoopers had been ticketed on June 4th, with fines totaling $2,500. They got these tickets practicing in a small, controlled group at the beach in OB. The article received a great response, but I started thinking about the voices that hadn’t been heard. The week before the Fourth of July had been an inopportune time to contact the police division, and thus no words from the police made it into the article. 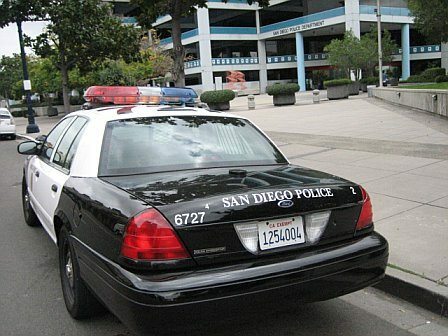 To rectify the situation, I called into the Western Division of The SDPD and left a message. The next day, I receive a phone call. Sergeant Misty Cedrun, the sergeant in charge of the beach team, is calling me herself, on behalf of Officer Schultz. Officer Schultz, who gave the hoopers the ticket, is in her division, and the two of them were behind the decision to ticket the burners. Cedrun begins by stressing how professional and respectful the group of hoopers was. Then she cites municipal code SDMC 63.0102(b)(11) (which is what Schultz used to ticket the hoopers) as meaning that any fire on the beach must be in a firepit or a barbeque. This summer is Cedrun’s first running the beach team, but she has organized a proactive team here in the west division for a year and a half. Officer Schultz, she says, has been on the beach for about two years. She loses herself in a brief tangent anyway, on the dangers and annoyances of a marshmallow war. And, we’re back. Cedrun explains that her division received an isolated complaint from a small group of OB locals. The residents wanted to know why the burners and hoopers were allowed to practice, but the residents couldn’t have fires outside of the firepits. So Schultz came on the scene, warning one group of burners on May 29th before ticketing a separate group of hoopers on June 4th. The burners and hoopers had been approached by other police officers in the past, and told to practice on specific spots on the beach. They were never shut down or ticketed, and they’ve been practicing at dog beach for over three years, according to burner, and group organizer, Scott Wakeham. I ask Cedrun why that is, and she sighed the weary sigh of a mother of a fickle brood. This seems all wrong, so I probe further. She explained that, when the law is not very clearly defined, officers have to figure out what the boundaries are for themselves, and they are all going to be a little different. She uses the example of smoking on the beach. Some officers say the boundary to smoke is where the sidewalk starts, some say the seawall, some say across the street. They are given the position of having to enforce boundaries that are blurred. “They don’t all have the fortitude to say, ‘I don’t know’ when a situation comes up,” Cedrun admits. So officers in the past read code SDMC 63.0102(b)(11) as allowing burners and hoopers only near the fire pits. Officer Schultz and Sergeant Cedrun have together changed that verdict, drawing the boundary at no spinning or dancing with fire, at all. Ever. Cedrun says it is dangerous, but hurries to explain that officers can’t give their opinions. It seems that practicing on the beach makes this law moot, as grass, shrubs, trees, buildings and property are all out of harms way. Indeed, it seems that the beach is the only place to practice and still be in compliance with the code. Cedrun warns, however, that it is not so simple. She explains that the hoopers were not even technically on the beach, but were instead in the grass park next to dog beach. Not much to burn here either, especially with “safeties” (people standing at the ready with fire blankets), but what about the private property there? The most pressing issue at hand for the burners and hoopers is where to practice, and to that Cedrun has no answers, although she does again assure me that the group of hoopers was very professional and she hopes that they find a place to go. Well, not the beach anymore. …does it mention public vs. private property. The two things I can see that it does mention are “…throw upon the ground…” and “…similar facilities provided by P&R Dept.” Neither of these specify not being able to burn of private vs. public property. So does that exempt private property from these codes? Wouldn’t that, then, allow the fire spinners & hoopers to safely practice on their own property? Not sure. So where do the officers get off interpreting the law? Clearly that isn’t their duty. Their duty is to enforce the law, not interpret it. I have had multiple conversations with actual fire spinners (who would like to remain annonymous) who stated, “The police told us to go practice on the beach.” Then, after following the direct advice of the cops, tickets were issued to anyone spinning on the beach. That’s like telling people who want to break the speed limit to do so in the fast lane then ticketing them once they thought they were given permission to speed by the same law enforcement offic. Can I hear a collective WTF? This is bs and it really burns my britches (no pun intended). Are the cops now trying to corral certain artists to a specific area where they know they can find them later only to ticket them in an covert attempt to generate revenue for the City? I say the cops need to stop interpreting the law to suit their own needs and go after real criminals like whoever hurt Dr. Chris on the 4th of July. Okay, I’ll get off my soapbox now (enter quiet exit here). Okay. So, the police claim that “residents” along the beach posted a complaint? I find that hard to believe (much like when a house party is loud – but not too loud). Cops roll through and hear noise, they come and do what they do. There’s no complaint, but more of an opportunity to investigate (and possibly fine). Then, she (Officer Cedrun) claims that “they were allowing” near fire pits. But most practices occur at Dog Beach? Again, an inconsistency in the police’s story. I’m not in any way “anti-police”. These people have a job to do and for the most part do a good job keeping us safe. And not to downplay this incident, but there are alot of people getting BS tickets recently. The state is virtually bankrupt, which means that cities are counties are sure to follow. This wasn’t about a “violation” it was about intolerance and money. More legalistic hair-splitting. It’s too bad that these officers choose to enforce “the letter of the law” rather than “the spirit of the law”. Besides, the fire pits are in danger of being lifted and deprecated due to “budget cuts”. Don’t know about you guys but I’m starting to think about investing in a whole mess of chicken feathers, if not to prove a point. Too bad we can’t get some tar rollin’ too. I know a few local politicians who might enjoy an aesthetic improvement with that kind of arrangement. We got 203 signatures on the “Save the OB fire dancers”. There’s no reason we can’t get 1000 signatures there. They could definitely practice on private property, provided that the property is big enough that no neighbors will complain. The issue is just that the beach is so much safer, since there is nothing flammable around. The beach is the safest spot in Southern California to have open flames. It’s good to hear both sides of an issue to make an informed decision. In keeping with Sunshine’s post, perhaps someone in or around O.B. who is a fan of the Burners and Hoopers and that also has some private property, could rent or donate their space so these folks can hone their craft much the same way places rent out rooms to bands so they can practice their music. How can the police enforce laws that they don’t even understand? And how can honest citizens be expected to obey those laws when something is legal to one officer and illegal to another? Well, you guys can argue that it’s a vague law, which it is, and you can try to get it clarified, which you should, but in the mean time the Burners and Hoopers still need a place to practice. So, they need a short term and a long term solution. Has anyone contacted Kevin Faulconer about this yet? I just sent Kevin Faulconer a link to this article and thread. Let’s see if anything becomes clearer. Soooo the LEO’s are blaming it on the NIMBY’s huh? I wouldn’t put it past them but… If the city can get money for yet another outlandishly priced permit, I’m sure they’ll go for it. Dog beach has soooo many barren remote areas that this should be a non issue. If the spinners have Fire blankets and a couple of fire extinguishers this seems safer than Joe Poluka squirting lighter fluid on coals on a grill by tower 4, who has neither. And another thing does the spinning fire ever hit the ground I’ve seen people spinning poi and hoops and the whole 9, I’m hard pressed to remember if pieces hit the ground/sand. so technically the “match on the ground portion of the law seems moot. i find it hard to believe that someone actually made a complaint. It will be interesting to see how this plays out if the fire pits are removed…however, I dont think the burners/hoopers should have to pay a fine if different cops interpret the law in different ways. I gather that with this situation, one cop on patrol would think it was perfectly legal, but then two nights later a different cop would write a ticket. seems unfair to have to pay a fine just because you were practicing on the “wrong” night. ClubStyle, ia a LEO a Law Enforcement Officer or the fifth astrological sign of the Zodiac? So it was the code I quoted in the original thread! Fight it. The word “liable” in the code places a condition on the previous act, in this case the act of lighting a fire. The only restricted act is lighting a fire that is “liable to set fire to any grass, tree, shrub, building, or other property.” Now, the cop could argue that the grass area on Spray street is liable to catch fire and I think he would be right. But if you are on the sand, it is a different story. The onus would be on the city to prove that you are liable to set fire to the sand with your fire tools. A herculean task if there ever was one. i understand from the grapevine that the burners and hoppers want to fight this big time. They are planning on fighting it, and we’ll be covering how that goes on the OB Rag, so stay tuned! What is J.F.G.?? It’s got me curious. It kinda sounds like you’re not obliged to follow those codes so long as you’re not on a beach. I’d have to see the whole section 63, though. The real issue is the police. Yes, they need to be schooled on what is and is not the law. unfortunately, the only person with the clout to make it stick is a judge, maybe even ALL the local judges coming to an agreement. Section 63 applies to SD Parks & Rec. Unfortunately it seems they’re right. The letter of the law does clearly state “any” fire. The spirit could be interpreted with wiggle room for small controlled fire (“liable to set fire to”) or in that certain parts of Parks & Rec infrastructure are suitable for the types of fire in question (“stoves, ovens, similar facilities”). Parking lots, for example, are well suited to the types of fire involved with fire performance. 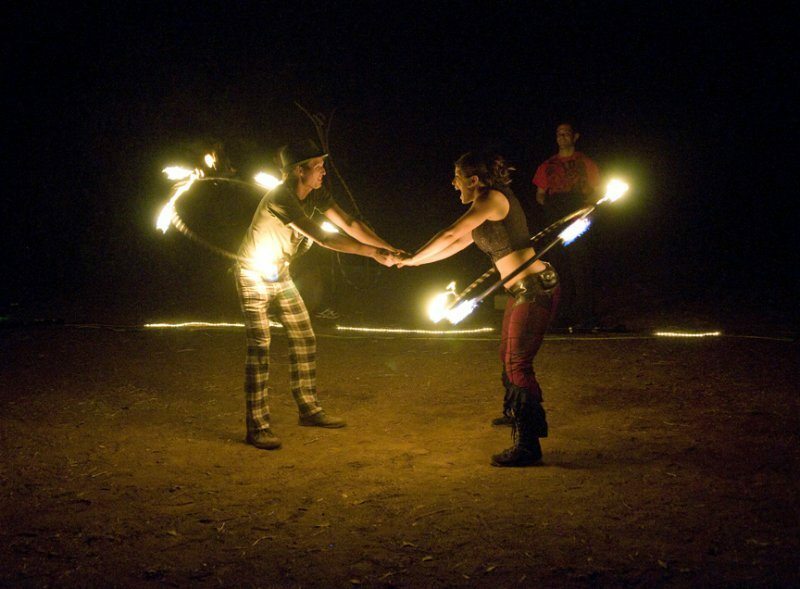 If fire performers moved out of Parks & Rec land then SDMC 63.0102(b)(11) would no longer apply to them. But that’s not to say another part of SDMC wouldn’t apply. The thing to do here might be to approach SD Parks & Rec for their take. If Parks & Rec can be brought on board, the police really have no business interfering. Has anyone spoken to them? Nothing the cited hoopers did would “liable” set fire to anything. The Municipal Code allows one to have a mobile BBQ set and have fire in it. If you can have that, then a hooper can twirl with fire. first: A GIANT THANK YOU TO THE OB RAG!!! YOU GUYS ROCK!!! being a former obecian (for 10 years) & also a burner just as long, i’ve been following this story from oregon as alot of my friends in OB are involved. and alot of spinners & hoopers are local obecians themselves. i just do not believe that any local residents who live near the beach are complaining at any time….they never have before and have always enjoyed watching the spinning, it’s free entertainment! the beach rights of san diego citizens are being slowly chipped away little by little. first smoking was banned, then alcohol was banned, then they have tried to take away the firepits. and apparently that is still up in the air wether they stay or go…now the spinners are being harassed for practicing in the SAFEST place possible. WHERE ARE ALL THE LOCAL POLITICIANS THAT ARE FIGHTING TO SAVE RECREATIONAL AREAS??? They always seem to want your @#$%^&& support during their campaign, but when you need there support to fight the man….WHERE ARE THEY? Must every right to have fun on the beach be taken away? the fire spinners/hoopers are very professional and responsible people who are in the safest place possible to practice…this should be a no-brainer for everyone involved. The residents at the beach report everything and anything that happens on the beach. What a bunch of losers!!! Wait, municipal code says I can throw chicken feathers? where do i get a bag of those? Also, I’ve never seen the hoopers, but I want to. are they coming back or have they been scared off?